Toledo is said to be Spain’s spiritual heart, a timeless, UNESCO-listed city where Muslims, Jews and Christians have peacefully co-existed for three centuries. After your city tour you’ll have time to explore—and eat—on your own; the food here is so exceptional that Toledo was named Spain’s gastronomic capital in 2016. A one-time ancient Roman colony, medieval Moorish capital and center for religious tolerance (that allowed Muslims, Jews and Christians to thrive), Toledo has been called Spain’s spiritual heart. What adventures await you in Spain? Today, you’ll visit the historic university town of Salamanca—the “Golden City”—famous for its sand-colored buildings and abundance of churches. Walk with a local expert through the Plaza Mayor, considered one of the most beautiful squares in Spain, and visit the university and the city’s astounding Food Hall. You’ll check out of your hotel this morning, heading from Madrid toward Portugal and your ship, which is waiting in Vega de Terrón, near the Portuguese border. Along the way you’ll visit beautiful Salamanca, the university town where Columbus sought advice before sailing west in search of a new route to the Indies. Go medieval today at Castelo Rodrigo, both the name of a hilltop castle as well as the village that surrounds it. The view from the top is incredible and the village is a charming place to ramble, relax and replenish. Or opt to take a small boat excursion into a national park to explore the Spanish side of the Douro. A tiny village surrounded by mountains, Barca d’Alva is your base as you explore Castelo Rodrigo, which has been singled out as one of Portugal’s 12 historic villages for its medieval beauty, or opt instead to cruise through a nature preserve along the Douro. Today is all about wine, which has been cultivated in the Douro River Valley since ancient Roman times. You’ll get a crash course in the history of making Port during your visit to the Douro Museum, then head to the hills to a prestigious wine estate, where you can sip Port while savoring marvelous views. Or, take a scenic drive to a family-owned quinta, where you’ll have a firsthand look at grape harvesting. Start the morning off by choosing a way to experience life in the Douro Valley: You can venture overland to Amarante, an ancient town on the banks of the Tâmega River, or visit a lovely quinta. One of Portugal’s top pilgrimage sites is our destination today, Our Lady of Remedies in Lamego. The church sits high above the town, accessible via hundreds of zigzagging steps adorned with beautiful blue and white tiles. After seeing the sights with a local expert, enjoy a tasting of locally made wines at a picturesque quinta. Today’s highlights include a visit to a picturesque hill town and a scenic cruise along the Douro river. The family-owned Quinta Aveleda looks like something out of a fairytale, with its lush flower gardens, peacocks and swans, shady terraces and whimsical follies—the perfect place to relax over a glass of vindo verde, the preferred drink of the region. Or visit an ancient town known for an iconic pastry and a shrine dedicated to the patron saint of marriage. You have a tough choice to make today: Would you prefer to venture overland to Amarante, an ancient town on the banks of the Tâmega River, or visit a lovely quinta? Guimarães or Porto? That’s the question of the day today (you really can’t go wrong either way). Guimarães is the town where Portugal was born and its well-preserved architecture and stylish young residents make it a pleasure to visit. Or opt to explore one of Porto’s oldest neighborhoods, picturesque Ribeira, considered the soul of the city. 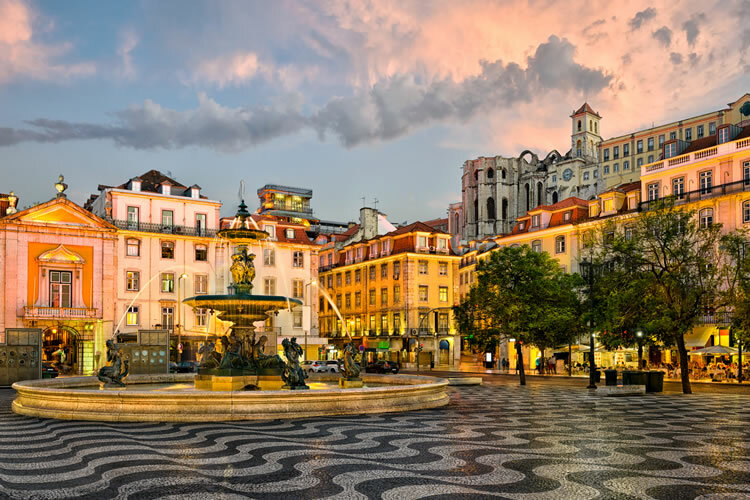 Today’s options include a visit to the historic town of Guimarães, where you can expand your acquaintance with Portugal’s various wine styles and traditions, and a chance to see Porto as the locals do with an adventurous walking tour. The tiny whitewashed village of Óbidos is so charming that Portuguese kings traditionally gave it to their brides as a wedding gift. Need we say more? Climb up to the imposing hilltop castle for spectacular, Instagram-worthy photos of the countryside and the sea beyond. You’ll disembark this morning and board a motorcoach, heading south through Portugal’s picturesque countryside toward Lisbon—but you’ll stop in fascinating Óbidos before you reach the colorful capital city. FEATURED EXCURSIONS: Lisbon city tour.